Tay-Sachs Disease - body, What Is Tay-Sachs Disease? Tay-Sachs disease is a rare inherited disorder that results in slow destruction of the central nervous system (brain and spinal cord). Tay-Sachs disease is a rare metabolic disorder with severe neurologic (nervous system) symptoms. "Metabolic" refers to the body's chemical processes that produce protein and other substances, and break down nutrients to release energy. Tay-Sachs disease is a metabolic disorder because it is caused by the absence of the enzyme (a type of protein) hexosaminidase A (Hex-A). Hex-A is necessary for breaking down fatty substances called lipids. Without Hex-A, these lipids build up in, and eventually destroy, the nerve cells in the brain. Ultimately, the nervous system stops functioning properly. How Does Tay-Sachs Disease Affect the Body? The most common form of Tay-Sachs disease (classical Tay-Sachs) affects children and usually is fatal. It is caused by a complete lack of Hex-A. Destruction of nerve cells begins before birth, but an affected baby does not begin to lose nerve function until he or she is about six months old. By age two, the child may have seizures * and begins to lose skills such as crawling, sitting, turning over, and reaching for things. Eventually, the child will be blind, paralyzed, and mentally retarded. Children with this form of Tay-Sachs disease do not live past age five. A variation of this scenario is when children develop symptoms between the ages of two and five rather than as an infant. The same symptoms emerge, but the disease progresses more slowly. Children with this form usually die by age 15. Late onset Tay-Sachs disease (LOTS) is less common than the infantile form. It affects teenagers and adults in their twenties and thirties by causing a gradual loss of nerve function. People with LOTS have low levels of Hex-A rather than a complete lack of it. As LOTS develops, people affected by it may grow clumsy, uncoordinated, and moody. They may experience muscle weakness, twitching, slurred speech, and intellectual impairment. The symptoms vary in type and severity from person to person. Because this form develops so gradually, life expectancy of affected people seems to be similar to that of unaffected people. How Do People Get Tay-Sachs Disease? Tay-Sachs disease is caused by a mutation (abnormal change) in the gene that codes for Hex-A, and it is a recessive trait. This means that people will have the disease if they have two copies of the defective gene, but they will not have the disease if they have at least one unaffected copy. People with one normal copy and one defective copy are called carriers, because they can pass the disease on to their children. * seizures are sudden altacks of disease, often referring to some type of violent spasms. Just about anyone can be a carrier of the gene for Tay-Sachs disease. In the general population, about 1 in 250 people carries the gene. People inherit Tay-Sachs disease when they inherit a defective gene from both parents, resulting in two defective genes that make the body unable to produce Hex-A correctly. People who have only one defective gene are called carriers. Carriers do not have the disease, because they have inherited one healthy gene to code for Hex-A, but they may pass the defective gene on to their children. 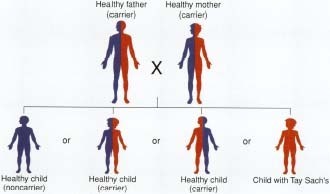 If both parents are carriers, each child born to them has a 1 in 4 liklihood of having the disease. However, some populations of people include more carriers than others. For example, 1 in 27 people of eastern European Jewish (Ashkenazi) descent in the United States is a carrier. People of French-Canadian ancestry from one part of Quebec and the Cajun population in Louisiana also have a higher than usual risk of carrying the Tay-Sachs gene. Is There a Cure for Tay-Sachs Disease? Although researchers are actively looking for a way to prevent or treat Tay-Sachs disease, currently no treatment or cure exists. However, tests have been developed that allow people to find out if they carry the defective gene. Blood tests can determine the level of Hex-A in people's blood (carriers have about half as much as noncarriers) and DNA tests may find evidence of mutations in the Hex-A gene. Testing is particularly useful for people who have had relatives with Tay-Sachs disease and for people in high-risk populations. Finding out about risk before having a baby can prevent the anguish of watching a child develop and then die from Tay-Sachs disease. Prenatal tests also exist for women who already are pregnant. The amni-otic fluid (the fluid in which the fetus develops) or the chorionic villus (structures inside the mother's uterus) both contain fluid from the developing baby that can be sampled and tested for the presence of Hex-A. If Hex-A is present, that means that the fetus does not have Tay-Sachs disease. Tay-Sachs disease was named for two scientists working on oppo-JL site sides of the Atlantic Ocean. Warren Tay (1843-1927) was a British eye doctor. In 1881, he described a patient with a cherry red spot on the retina of eye (the structure inside the eye that receives light). This spot is characteristic of the classical form of the disease. An American neurologist (nerve and brain specialist) named Bernard Sachs (1858-1944) described the changes in cells caused by the disease. He also recognized that it was an inherited condition that ran in families and that most babies with the disease were of eastern European Jewish descent. National Tay-Sachs and Allied Diseases Association, Inc., 2001 Beacon Street, Suite 204, Brookline, MA 02146. Late Onset Tay-Sachs Foundation, 1303 Paper Mill Road, Erdenheim, PA 19038. March of Dimes Foundation, 1275 Mamaroneck Avenue, White Plains, NY 10605.